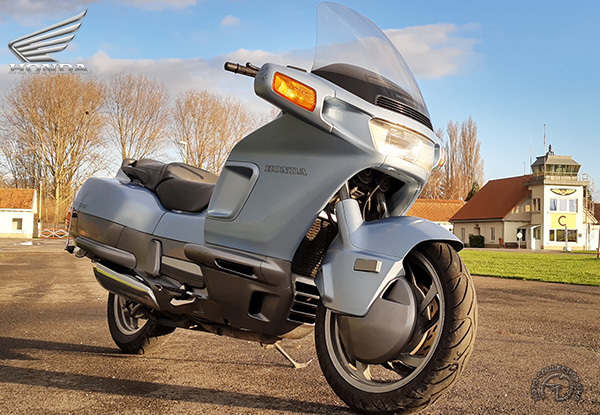 In the past half decade, the touring motorcyclists' love affair with Honda's Gold Wing and Silver Wing models has reached a high undreamed of in the past. The Gold Wing has come to symbolize a whole world of motorcycling, touring, and in fact, lifestyle. Little wonder then, that Honda would try to capitalize on its success by creating a modern sport-touring takeoff on the Gold Wing. Enter the Pacific Coast. The most striking feature of the Pacific Coast was its flowing, full-enclosure bodywork that was designed to appeal to two different market sectors. On one hand, the bodywork covered all mechanicals, telling the new rider that here was a trustworthy motorcycle that never required you to get dirt under your fingernails. On the other hand, the faired body told tried-and-true riders that this was a sporting tourer – in the style of Honda's CBR Hurricane sportbike. Launched in 1988, the PC800, as it was coded, found a market but it was never as large as Honda had wished for. The 800cc engine was seen as too small for serious touring, although no one complained about the shaft drive and rear seat that tilted forward to reveal a hidden luggage compartment like the trunk of a car. Like licorice, those who liked their Pacific Coast, truly loved them. The PC800's massive gas tank held a full 4.2 gallons of gasoline, enough to carry the faithful rider over miles of winding road.